- secondly to act as a backup moisture barrier behind cladding. Housewrap is not a vapour barrier but it will help to maintain the R-Value of the insulation in exterior walls. Housewrap is a building membrane that, as the name implies, is wrapped around the exterior of new homes and additions prior to the final exterior being installed. Building paper or tar paper was and still is widely used to prevent wind from penetrating into a wall and secondly to act as a backup moisture barrier behind cladding. The name housewrap defines all synthetic replacement materials for tar paper. These materials are all lighter in weight and usually wider than building paper, so contractors can apply the material much faster to a house shell. 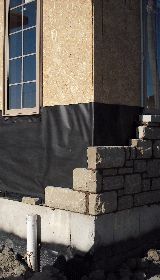 Housewrap is used to limit air leakage, functions as a weather-resistant barrier, preventing rain from getting into the wall assembly while allowing water vapor to pass to the exterior. If moisture from either direction is allowed to build up within stud or cavity walls, mold and rot can set in and fiberglass or cellulose insulation will lose its R-value due to heat-conducting moisture. Housewrap must be both waterproof and have a high Moisture Vapor Transmission Rate (MVTR) to be effective. It must also take handling abuse during installation and be resistant to UV. Housewrap is often left exposed for some time after construction, awaiting exterior sheathing installation. The original asphalt paper design, while heavy and slow to install, is still a contender. It can be nailed and abused during installation and still function. Some new designs must be installed carefully or they will slightly rip or tear during installation, possibly allowing for water infiltration at the damaged areas. Housewrap should be installed with plastic washer-head nails or 1" staples with plastic heads. Also, tears and seams have to be taped with a high quality and special designed house wrap tape. 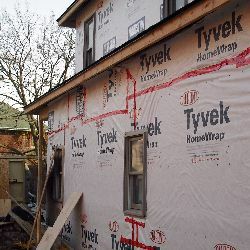 Housewrap is installed over the sheathing and behind the exterior siding, it is the last line of defense in stopping water or moisture from getting into the exterior wall construction.